Everyone tells you that having a child will change your life. What they don’t generally mention is the physical pain of it, that unique and special torture called sleep deprivation. Depression and anxiety grow unchecked, your ability to remember fades. You see things that aren’t possibly there. You recede into yourself, and your animalistic lower brain takes over. As your baby slowly begins to sleep better and grow, you start to come back into yourself. 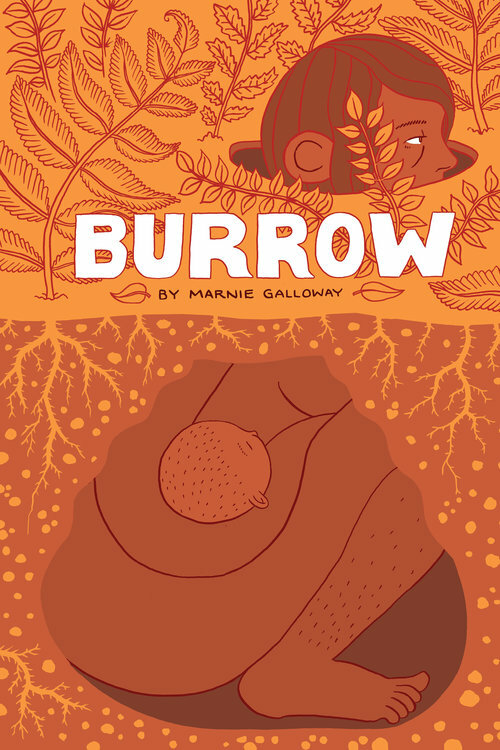 In Marnie Galloway’s new comic Burrow, the artist uses her own experiences as a new mother as the fuel for a poetic examination of personhood, the feral relationship between mother and infant, and the darkness of a mind clouded by lack of sleep. Burrow flips between the present where a single woman takes care of her newborn baby, and a flashback two years previous. The woman is an entomologist, studying deathwatch beetles, and we begin to watch her relationship with an unnamed man fall apart. It’s not hard to put the pieces together about what’s happened with that relationship in those two years. In the present, the relationship between the mother and child is intense and raw. Exhaustion is evident in her face, and the changes of childbirth are starkly visible between the two timeframes. It’s clear Galloway is illustrating from a body of hard-earned experience. The physical pain is so beautifully represented, and so is the tenderness. Galloway has a clear talent for depicting emotion, and uses it to great effect in Burrow. text of “To a Child.”) The deathwatch beetle is an ancient symbol of death. Galloway’s use of the beetle in this comic is interesting, because it forecasts the death of the relationship between the main character and the man depicted in the flashback. The deathwatch beetle has a storied history in American literature. It has been used as a symbol in the work of Edgar Allan Poe, Thoreau, and Mark Twain. There are some aspects of Galloway’s use of the beetle that I’m not sure I understand – what does the deathwatch beetle tick at the end of the book mean for the overall narrative? I recently reviewed Galloway’s In the Sounds and Seas, and I see similarities between that longer work and this 32-page black and white comic. Galloway’s style has changed slightly, avoiding the heaviness of In the Sounds and Seas, but her dark line and penchant for pattern-making are all still present. 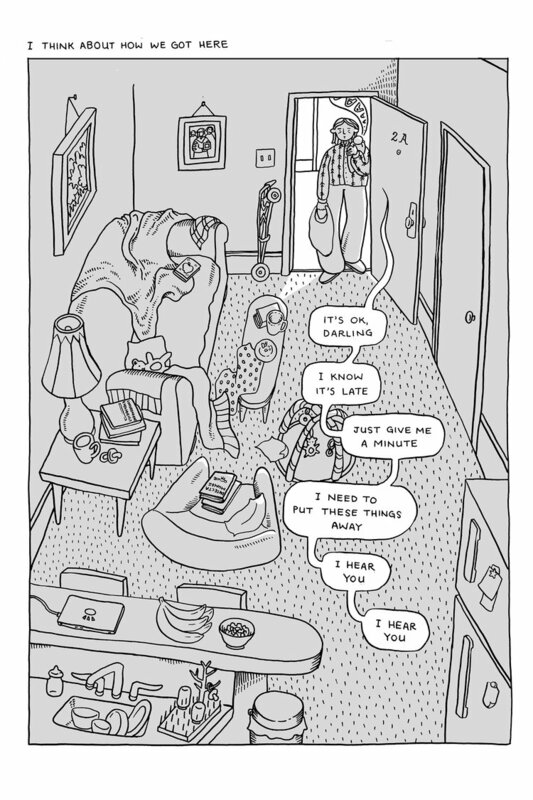 There is a poetry to Galloway’s comics, and that sense of the poetic is intensified in Burrow. The phrasing of Galloway’s character’s thoughts in early morning hours while she is awake breast feeding her newborn has a specific cadence. The notation is clearly meant to indicate line breaks in a confined space, often used in written poetry. 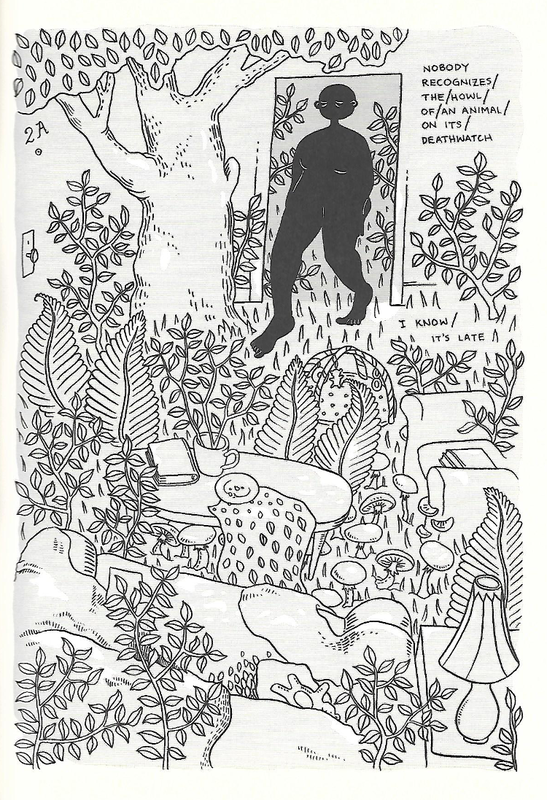 There is a lot of symbolic repetition throughout Burrow, culminating in a hallucinated forest in the middle of the apartment. The mother is emptied out through her physical connection to her child, and remakes herself from the thing she forages from the space. and the mess of caring for a newborn and delivers a meditation on personhood and motherhood that is undeniable. If this is your first time reading a review at Sequential State, or your 100th, I’m glad you’re here. If you’re a repeat reader and come to Sequential State for criticism and commentary, please consider supporting us on Patreon. Thanks! 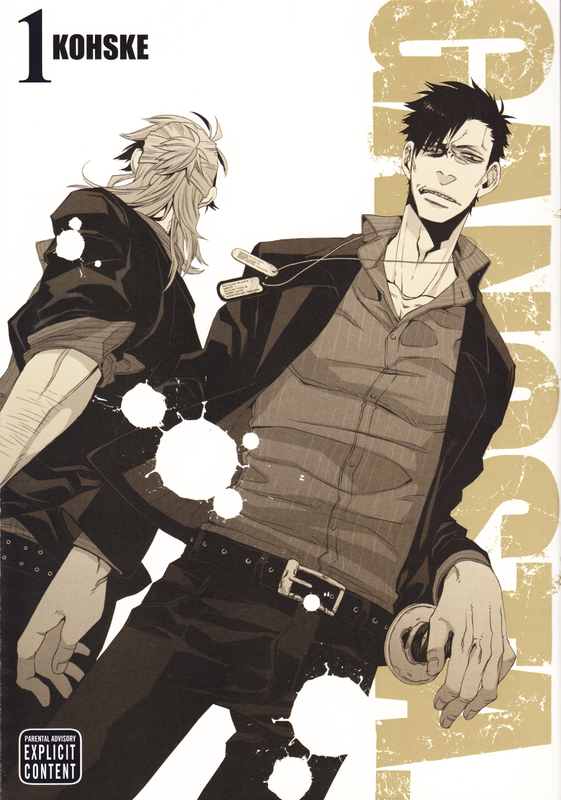 Manga Worth Reading #2: Gangsta.